Well, i still believe in that, but i want to get a bit more focussed in the days to come and that is why i thought its about time i created a plan of action and set about achieving it.. if not all, then as much as possible!! no use saying Nothing is happening when i dont put in required effort... !! Quite happy with the way my mind, body and soul are working... Complete sync with each other, when i mentioned this to a friend, she said "you are maturing sweetheart, in control of yourself, am proud of you"...!! So, Here's to me and 2010..!! lets see how far i get.... !! Wish me luck!! tats the spirit!..Wishes to a stellar 2010,..May all ur dreams come true..
wishing you a great 2010 Aarti... have a helluva ride with lot of fun experiences.. LOL..
P.S : It was such a superb meeting with u guys on last sat :) . Kya PIE chart and all !!!! Such clear thoughts and preferences for 2010 !!!! Wishing you an year, which makes all these TRUE !!!! It was great, meeting you, too !!!! 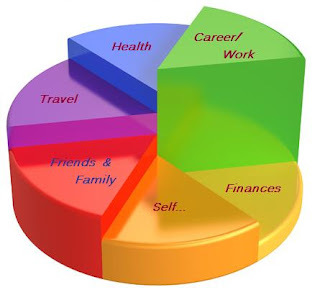 cool pie chart more like the one I would project for this year :) plus I would add loads of fun element to tht :) All the best ! buddy! It gets down to choose a correct partner who uses your funds in a right way - that is incorporate it in real business, and shares the profit with me.